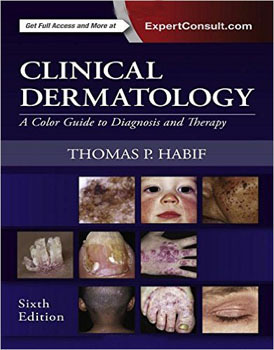 Identify, treat, and manage the full range of skin diseases with guidance from Clinical Dermatology: A Color Guide to Diagnosis and Therapy the world�s leading dermatology manual. Clean formatting, easy indexing, and exceptional color images make this an indispensable source for definitive, state-of-the-art answers on every aspect of dermatologic care. Make rapid, confident decisions on diagnosis and treatment by comparing your clinical findings to over 1,000 of the highest quality color images?including hundreds of original, never-before-published photographs?depicting virtually any skin condition. Apply the newest developments in diagnosis and treatment thanks to thorough updates throughout including an extensive section on the management of acne, eczema, and psoriasis as well as expanded coverage of arthropod disease. Prescribe effective dermatologic treatment with an expanded formulary to the most commonly used drugs; detailed guidance on the use of antibiotics; and the inclusion of the latest drug treatment options. Quickly access vital, up-to-date information from new tables throughout summarizing "need to know" diagnostic and therapeutic evidence.